In 1492, Columbus built a small fort near what is today the town of La Vega in the central Dominican Republic. It was intended to guard the route to the interior gold deposits of the Cibao valley. A Spanish settlement known as Concepción de la Vega gradually grew up around the fort, and after 1508, when gold was found in quantity there, Concepción became America’s first gold boomtown. By 1510 it was one of the largest and most important European cities in the hemisphere. The town was destroyed and buried by an earthquake in 1562, and the survivors relocated to the present site of La Vega after that time. 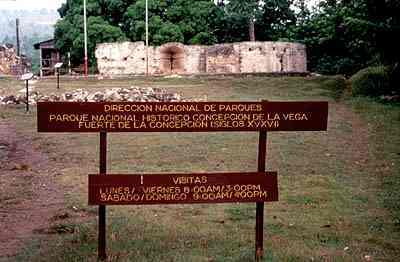 The site of the ruined town remained largely in farmland until 1975, when a small portion of the original city was purchased by the Dominican government in 1976 and named as the National Park of Concepción de la Vega. Excavations were carried out at the site under the auspices of the Dirección Nacional de Parques between 1976 and 1995. This work exposed the remains of several stone buildings in the center of the site, including a magnificent fort with an intact tower. The remnants of other stone buildings, an aqueduct water system, a foundry and several water wells were also excavated. The remains of the monastery of San Francisco, built in 1502 and the location of Bartolome de Las Casas’ invocation, were also excavated, and these, along with the ruins in the site center, are interpreted to tourists and visitors to the Park. 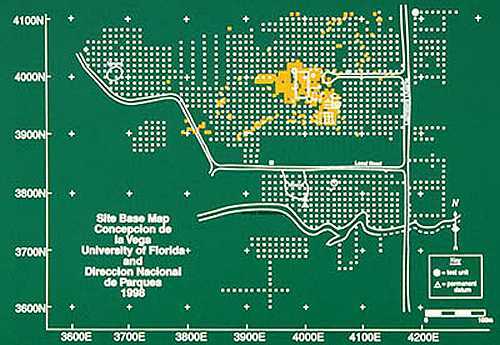 In 1994 historical archaeologists from the Florida Museum of Natural history entered into a collaboration with the Dominican Park Service to realize two primary goals in the conservation and interpretation of the site. The first of these was to survey and map the site in order to document the original size and location of the sixteenth century city, as well as to identify the locations of various activities within the town boundaries. The second goal was to catalogue and curate the more than 200,000 artifacts that had been excavated over the years at Concepción de la Vega. The Aljibe (water cistern) fed by mountain streams and the source for the aqueduct that brought water to Concepción de la Vega. It is still used by local residents today. A systematic sub-surface survey of the region was carried out between 1996 and 1998 by archaeologists Alfred Woods, Jeremy Cohen, Maurice Williams and Terry Weik, working with a team of 25 local residents. The results of the 1,625 tests (each 25 cm. by 25 cm. square, and 1 meter deep) showed that the sixteenth century town measured approximately 400 meters north-south and 640 meters east-west. With an area of more than 250,000 meters square, it would have been the largest Spanish city in the New World until the 1520’s. Laboratory analysis carried out concurrently with the survey recorded more than 220,000 artifacts excavated at the site before 1995. Concepción de la Vega had the richest, most diverse and most abundant material culture of any early sixteenth century Spanish site excavated so far. This was undoubtedly related to the wealth brought to the city by gold. Such luxury items as clothing items and adornment; Venetian glassware, ornate furniture hardware, horse equipage and books are considerably more frequent here than at other sites. Of particular interest are the Indian-made ceramics known as “Cerámica Indo-Hispano.” They are completely unique in the Americas, showing combinations of Caribbean, Central American, South American and European elements. These pots are poignant reminders of the terrible fate of the Caribbean Indians, who were enslaved and ultimately perished in order to produce the gold upon which the Spanish town was built. Two local helpers, Francisco Maracallo (El Cápitan) on the left and José Coste Ruiz (Papa Checo) on the right, together with Al Woods and Terry Weik. 1997 The 1996 Survey at Concepción de la Vega, Dominican Repubic. MA Project, Department of Anthropology., University of Florida. 1999 Cultural and Historical Resources at the Parques Nacionales Conepción de la Vega and La Isabela:Final project report submitted to the Dirección Nacional de Parques, Santo Domingo, and U.S.A.I.D. On file, Florida Museum of Natural History, University of Florida. 1998 Reporte preliminar del análisis del laboratorio del Parque Nacional Concepción de la Vega, 1996-1997. Project report submitted to the Dirección Nacional de Parques, Santo Domingo, and U.S.A.I.D. On file, Florida Museum of Natural History, University of Florida. 1997 A Report: The Fort at Concepción de la Vega, Dominican Republic and Standards, Interpretation and Conservation. Consultant report, submitted to the Dirección Nacional de Parques, Santo Domingo, and U.S.A.I.D. On file, Florida Museum of Natural History, University of Florida. 1999b Reporte del survey arqueológico sub-superficial en Concepción de la Vega: Campañas de 1997-1998. Project report submitted to the Dirección Nacional de Parques, Santo Domingo, and U.S.A.I.D. On file, Florida Museum of Natural History, Gainesville.